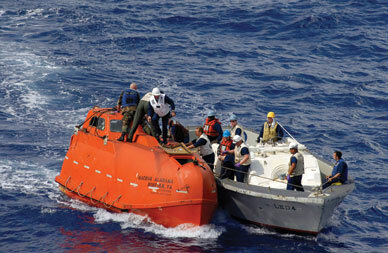 JON RASMUSSEN/AP PHOTO A US Navy team tows the lifeboat where Somali pirates held Capt. Richard Phillips captive. The Navy’s daring rescue of Richard Phillips, kidnapped captain of the Maersk Alabama, drew such media trumpeting and general cheering around the globe that readers and viewers may be excused for thinking modern-day piracy is something new. Actually, all that’s new is the boldness of the well-armed Somali corsairs and, in the case of Phillips’s 17,000-ton container ship, the fact that the flag and the captain were American. Until now, piracy has never been a big story here or abroad because most ship owners, as well as their cargo clients and insurance companies, have played it down, willingly paying multimillion-dollar ransoms for the return of hijacked vessels and placing their crews in harm’s way because the financial cost of piracy is far less than that of protecting the ships. These numbers tell only half the story. The IMB estimates that more than half of attacks go unreported, especially the many hit-and-run jobs where boarders make off with the crew’s cash, cameras, laptops, DVD players and occasionally the captain’s safe. Ship owners avoid revealing the assaults to authorities because doing so risks a hike in insurance premiums and brings on tedious investigations in the nearest port, which may or may not be on the ship’s route. Better to avoid costly delays and endless paperwork and keep the shippers happy by moving their cargo full speed ahead to the store shelves. No reliable statistics measure the annual cost of piracy, but one likely high estimate of $16 billion represents only .001 percent of the more than $14 trillion in world trade that moved by ship last year. Much of this fraction is covered by insurance, so the Maersks and Wal-Marts have easily written off the ransoms and even the occasional loss of ships and cargoes worth tens of millions of dollars as the cost of doing business. The human victims have long been expendable. Thousands of crew members, usually poor and nonwhite, serve on container ships, tankers and bulk carriers for as long as a year at a time, with almost no time off. When pirates manage to clamber aboard, these underpaid, perpetually exhausted men are always terrorized, frequently injured and sometimes set adrift in lifeboats or murdered outright on deck and dumped into the sea. Now that the Somali pirates have grabbed the world’s attention, the cry has gone up for the navies of developed nations to increase their presence in the waters off Somalia or even for the US military to take out the pirates on land. Military action can be successful, as the Navy marksmen demonstrated by killing three pirates to free Captain Phillips. But the Somali buccaneers write that off as their cost of doing business, a criminal enterprise that brings millions of dollars to the economy of an outlaw land with few other resources. Within hours of the Phillips rescue, Somali pirates had attacked at least four other ships in the Gulf and were promising to take revenge on Americans for the deaths of their comrades. After the Maersk Alabama incident, an executive of the Danish conglomerate said, “Our main concern is always the safety and security of our crews.” But for years Maersk and most other shipping firms, large and small, have refused to spend the money it would take to make each vessel more secure. Few, for example, have invested in Secure-Ship, an electrified wire fence that delivers a 9,000-volt nonlethal shock to anyone attempting to climb aboard. There are other tactics merchant ships could employ to reduce piracy, from placing private armed teams aboard during passage through dangerous waters to avoiding those waters altogether. These and other safety strategies would doubtless cost a lot of money, but until the shipping community abandons its pinch-penny cynicism, piracy off the coast of Somalia is certain to grow and to encourage brigands elsewhere.